The earth in front of Smo'dis began to rise and take form, and soon a massive hulk of living rock stood in front of him. Smo grinned in satisfaction, and beckoned his new servant to his side. The earth elemental was happy to oblige. This was a welcome change for Smo. Usually, it was the mud that was controlling him. But when he concentrated hard enough, he could call upon that same mud, and rock, and create a servant of his own. Recalling the terrifying power of mud, he strolled into the fort, his servant following, and threatened a random gruntee with the phrase "Mud guin get lat!" In an odd coincidence, that same day, Smo's old rival Girm'luhk had awakened. Girm took this call as a challenge, and easily crushed the elemental without breaking a sweat. "Der hab tu be wai tu makr tuffur mudhumiez," Smo muttered to himself as Girm delivered the finishing blow. The next day, Smo ran into the old mojoka Crag'tar at the guard tower following a bootcamp. 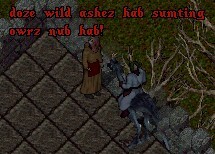 "Ey Crag," he asked, "Wut lat gruk abowt rokhumiez?" "Me makrd rok humie, agh ash grunt clompd it!" Smo said. "Me studiun dem; me tink der am bettur wai tu makr dem. . . der hab tu be sumting uz duin rung!" "Wel," Crag replied, "Dem big, muddi. . . dem nub dat hard tu clomp. Dem weeker den da wild ashez." Smo nodded. The wild ones were stronger; perhaps the older mojoka was on to something. "Dat da problum!" he exclaimed. "Doze wild ashez hab sumting owrz nub hab!" "Ib uz studi dem mebbi uz kan find it. . . me neeb tink bowt dis." Smo'dis turned and dashed down the stairs. A guard called a threatening warning to him on his way out, but he didn't listen. He was lost in thought, already visualizing the next step of the process in his head. He had no idea just how far this process would go. Smo'dis and Og'Luzk stood outside the dark cavern. A gentle wind blew from the west, sending ripples through Smo's robe. He looked at Og'Luzk and said, "Lat membur da plan, rite?" Og nodded. The two had not planned this field research for very long. In fact, Smo just walked up to Og and asked him to come and help, and he agreed. 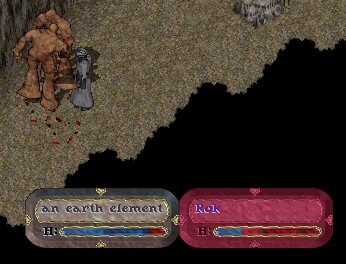 The pair entered the dungeon, and were immediately assaulted by a pack of earth elementals and scorpions. They stuck together in cross-healing formation, and between Og's olig and Smo's mojo, they quickly cleared the hallway. "Membur, NUB CLOMP DA ROKHUMIE AT ALL!" Smo called out as his tribemate headed off into the darkness. "Kal Vas Xen Ylem!" and Smo's own earth elemental slave climbed out of the rocky floor. "Smo, obur heer!" came the call from somewhere in the cavern. Smo waved Rok to follow, and they soon found a single earth elemental chasing Og'Luzk through the rocky passage. "An Lor Xen" and soon Rok was pounding on his slightly confused wild counterpart. 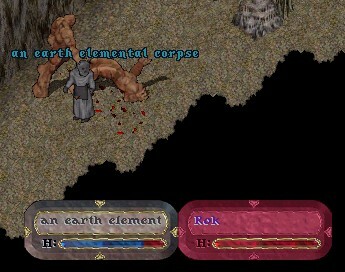 Unfortunately, the commotion caught the attention of another earth elemental, who aided his friend in pounding on Rok. 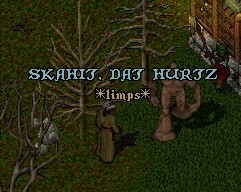 "Skah," Smo muttered to himself. "Deez rezultz guin be skuu'd." But then he had an idea. "Ey Og, clomp da week ash, nub hurt da uddur ash!" he called. Og'Luzk responded with a flurry of crossbow bolts at the weakened earth elemental, while Smo directed Rok to focus on the same one. 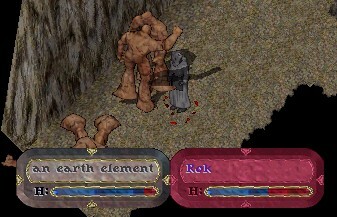 Rok fell, but soon after, so did the weaker elemental. "Diztrakt im but nub hit im!" Smo called out as he raced towards the dungeon entrance. Soon, another Rok was ready to fight. "DUWN HEER!" Smo called out. Og'Luzk led the earth elemental to the entrance. One An Lor Xen later and the test had begun. "GET IM!" Smo called out, and Og'Luzk brought the earth elemental crashing to the ground. Smo cleared out all the useful items such as ore and gold, and found two things left on the corpse. 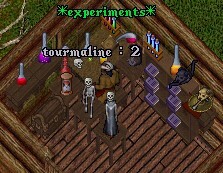 He quickly mojoed the pair back to the Surjin hut, raced upstairs, and experimented with the gems and dirt. Smo studied his results carefully, then let out a gasp when he discovered what the problem had been this whole time. "Dis muzt be it!" he remarked. "Agh ib dis wurkz fur ROK humiez, mebbi da uddurz. . . "
Smo'dis grinned widely with satisfaction. It had been nearly a month since his self-imposed exile from the clan. While others slept, he spent long hours in the Surjin hut testing; while they fought, he slept from exhaustion. With the exception of Nholg's experiment with thinner ligz later in the month, Smo didn't notice much of anything during this time. Mojo is an exact science, and Smo knew that the slightest mistake could be disastrous. However, after running many tests in the laboratory, Smo felt he finally knew the key to making rock humies stronger. It worked in theory; all that was left was the test. He eagerly raced to the chests, preparing himself for the event. He ran into P'rigka while finishing his preparations. Smo felt a little guilty that he didn't know much about the newest of Surjinz, but he was very busy with his research. There would be time for tribe bonding later. But for now, since she was here, she would make an excellent assistant in the experiment. "Ey P'rigka," he said, "kum wif me. Me neeb latz helb." The two exited the hut, and Smo began chanting the magic words. "Kal. . . "
The standard reagents needed to cast the Earth Elemental spell began to hover in front of Smo'dis. In addition, a clump of dirt hovered with the weeds. Smo squinted to maintain his concentration on the spell. "Ooo," P'rigka murmured as she watched a fly buzzing carelessly around the meadow. It circled P'rigka's head a couple of times, then lazily flew towards the mojoka. Darting among the floating ingredients playfully, the fly decided to find a new place to play. Smo instinctively blew a large blast of air out of his nose, firing the fly out towards the ground. It regained its stability in mid-air and buzzed off, in search of some food. Relying completely on instinct and experience, he immediately regained control of the reagents, which had fallen no further than waist height. However, his instinct and experience did not aid him in recovering the clump of dirt, which continued its descent and smashed into Smo's leg in a magical flash. "YAAAAAAAARGH!!!!!!!!" the mojoka screamed as a sharp pain coursed through his leg. The spell was completed, and Smo's warrior-slave Rok arose from the dirt. If Smo had not been distracted by the pain in his leg, he would have noticed that Rok had not become stronger; but since the dirt he needed for the spell was burning into his leg, that wouldn't have been much of a surprise anyway. Just for the record, Smo asked P'rigka to test her kigg on the earth elemental, and sure enough, the experiment was a failure. At this point, however, Smo was more concerned with his leg than with the experiment gone awry. As he limped to the Surjin hut, a concerned P'rigka asked him if he needed anything, such as crutches or a bandage. Embarrassed by his mistake, Smo shook his head and hobbled into the hut. He lifted his robe in order to examine his leg. As he expected, it was covered in rock, mud, and dirt. He began wiping it away, only to find more underneath it. He poked his finger in, feeling for the skin, and was a bit startled when it came out of the other side of his leg. "Me hab nubhosh feelin bowt dis. . . " he mumbled. "Kal Vas Xen Ylem! AWAKUN ABHU!!" 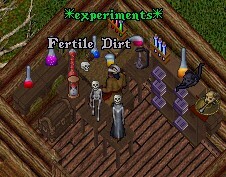 Smo threw the reagents in the air along with a clump of dirt. They began glowing, then sank into the ground. Soon after, Abhu the elemental tore its way out of the ground and stood at attention, ready to do Smo's bidding. Smo gestured to the nearest shardee. Abhu tore it apart with ease. The mojoka toed through the remains carelessly. "Ooo, wud lat luuk at dis!" he exclaimed. He bent over and picked a bola ball out of the dead shardie's pack. "Dis kan be beri uzeful!" He tossed it into a bag by the forge, where he found three more just like it. "Oo," he squealed, "dis am enuff tu makr bula! Ey Abhu, gu owt intu da wuudz agh get me sum leddur." The giant mass of rock nodded once, then went out the back door. HHH minutes later, Smo realized something was wrong. Not even the newer, stronger breed of rock humies stayed above ground this long. He went to investigate. Smo was too late. He found Abhu's remains lying face down in the ground, the remains already beginning to sink into the uzg to await Smo's next summons. He quickly pulled off a chunk of rock, and examined the fingerprints on it. Humies had clomped Abhu. There were three of them. Worse yet, they had discovered the magical clump of dirt which had made Abhu strong, which meant that they would soon figure out the secret to making all of the elementals strong. "Wull, me gezz uz bettur be reddi tu fite deez tuffur monzturz," he said to himself as he headed back to the fort, his rocky leg thumping as he walked.